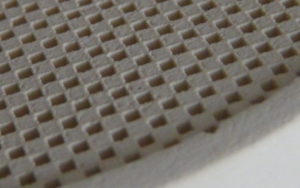 To capture the soot particles, present within the exhaust stream of any Diesel Engine, IMSeco uses a “Wall-Flow” DPF (Diesel Particulate Filter) where every alternate cell in the porous ceramic substrate is capped to form a “Checker Board” pattern on the front and rear face of the substrate. Particulate Matter (Soot) in the exhaust stream enters the DPF through an open cell but cannot exit at the opposite end due to the cell being capped. 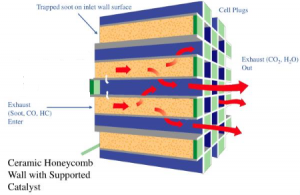 The exhaust gases pass through the porous walls of the substrate and out through an adjacant cell. To prevent the DPF from becoming blocked, the soot particles captured within the DPF needs to be regenerated, which can be done “passively or actively” dependent on exhaust gas temperatures present. 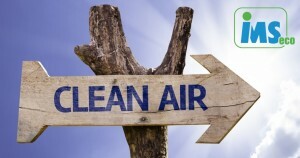 That said, even in cases where Active Regeneration is used due to insufficient exhaust gas temperatures, it is “Desirable to maximise the amount of passive regeneration possible since passive regeneration is free” requiring no additional energy, which is why IMSeco adopts both techniques. 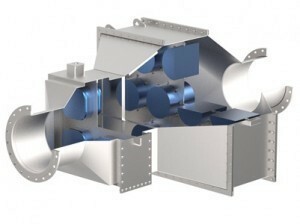 The IMSeco DPF system would in many cases use a DOC (Diesel Oxidation Catalyst) which is manufactured from a Corrugated Metallic Substrate coated in a precious metal solution that draws oxygen molecules and NO2 to its surface that travels into the PDF to passively reduce up to 99% of the particulates (PM10/PM2.5) captured within the PDF. The DOC will also dramatically reduce the Carbon Monoxides (CO) and Hydrocarbons (HC) present within the exhaust stream and can also be used together with the Hydrocarbon Injection System to vaporise the fuel across the DOC elevating the exhaust gas temperatures when active regeneration is required. Once combusted the soot particles turn to ash which migrate to the ends of the cells within the PDF. The ash would need to be removed periodically by cleaning of the DPF, generally on an annual basis. 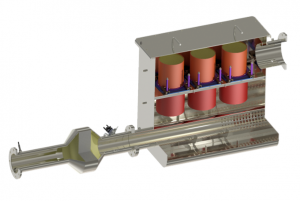 Dependent on the duty cycle IMSeco will either use a Ceramic or SIC (Silicon Carbide) DPF Substrate which has been approved by the Swiss VERT Program (a requirement of the London NRMM LEZ). 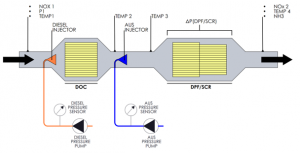 The system shown below is an example of the IMSeco Active regeneration system using “Hydrocarbon Injection” to vaporise the fuel across a DOC upstream of the PDF, elevating the exhaust gas temperatures to keep the DPF Clean. The system shown below also incorporates the IMSeco SCR Technology that also reduces NOx details of which can be found in the IMSeco SCR Technology on our website. 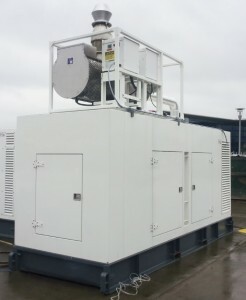 For “Stand-By” or “Prime Power” Generating Sets, IMSeco are also able to offer its patented “Electrical Regeneration Technology” where an electrical current taken from the generating set is applied directly to the filter media electrically powered heat that elevates the exhaust gas temperatures to between 600-700C to oxidize any accumulated soot in the self-regenerating “Active DPF Filters” in a controlled manner within 3 minutes while typically using less than 1% of the generator output. The IMSeco “Electrical Regeneration Technology” has built in microprocessors that monitor back pressure, temperature and elapsed time between re-generators to control the regeneration cycles efficiently and safely, so your stand-by power is available when you need it most.